e-commerce is nothing but buying and selling of goods around the web. On the contrary, e-business is a little different as it is not limited to, commercial transactions, but it also provides other services. These are the two emerging modes of doing business, which are gaining importance with the passage of time. Gone are the days, when you have to go to the market to buy a single item. Nowadays you just have to place an order online, and that item will come to you within few minutes. Online shopping is getting popular, just because of its simplicity and convenience. This is possible only because of two electronic networks, namely, as e-commerce and e-business. e-commerce is concerned with the firm’s dealings with its customers, clients or suppliers. Conversely, e-business refers to undertaking industry, trade, and commerce, with the help of information technology and communication. The article presented to you explains the difference between e-commerce and e-business. Meaning Trading of merchandise, over the internet is known as E-commerce. Running business using the internet is known as E-business. Requires Website Website, CRM, ERP, etc. Which network is used? Internet Internet, Intranet and Extranet. e-commerce is an abbreviation used for electronic commerce. It is the process through which the buying, selling, dealing, ordering and paying for the goods and services are done over the internet is known as e-commerce. 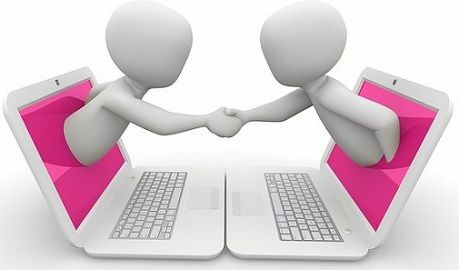 In this type of online commercial transaction, the seller can communicate with the buyer without having a face to face interaction. Some examples of real world application of e-commerce are online banking, online shopping, online ticket booking, social networking, etc. B2B – The process where buying and selling of goods and services between businesses is known as Business to Business. Example: Oracle, Alibaba, Qualcomm, etc. B2C – The process whereby the goods are sold by the business to customer. Example: Intel, Dell etc. C2C – The commercial transaction between customer to customer. Example: OLX, Quickr etc. C2B – The commercial transaction between customer to the business. Electronic Business, shortly known as e-business, is the online presence of business. It can also be defined as the business which is done with the help of internet or electronic data interchange i.e. is known as E-business. E-commerce is one of the important components of e-business, but it is not an essential part. Brick and Click: The business model, in which the business exists both in online i.e. electronic and offline i.e. physical mode. Buying and Selling of goods and services through the internet is known as e-commerce. Unlike e-business, which is an electronic presence of business, by which all the business activities are conducted through the internet. e-commerce is a major component of e-business. e-commerce includes transactions which are related to money, but e-business includes monetary as well as allied activities. e-commerce has an extroverted approach that covers customers, suppliers, distributors, etc. On the other hand, e-business has an ambivert approach that covers internal as well as external processes. e-commerce requires a website that can represent the business. Conversely, e-business requires a website, Customer Relationship Management and Enterprise Resource Planning for running the business over the internet. e-commerce uses the internet to connect with the rest of the world. In contrast to e-business, the internet, intranet and extranet are used for connecting with the parties. e-commerce is the major part of e-business. It can also be said that e-commerce is e-business websites, but e-business is not necessarily e-commerce. The former is just the online presence of the conventional commerce and the same is the case with the latter. At present most of the companies are doing e-business just to capture the maximum part of the market. Some e-commerce websites have emerged since last few years who are vanishing the market traditional commercial business, like Flipkart, Amazon, eBay, etc. Thank you for the information and content provided by you that’s the amazing. thanks a lot. you made it so easy to understand. very useful information to understand basic concepts. This write up and explanations are most helpful in the simplest form. Thank you for this. I loved the information given! Appreciate the content, and very useful. Thank you.